While the structure of Chile’s elementary and secondary education has changed considerably since the demise of the Pinochet dictatorship, the Chilean system is currently undergoing intense scrutiny due to the recent mass student protests against President Bachelet’s proposed 2006 education policy, Ley General de Educación (LGE). This General Education bill promises to eliminate discriminatory admissions policies at Chile’s primary, secondary, and tertiary education levels, and establishes a National Education Council to further advance school autonomy away from state control. However, teachers and students continue to oppose the LGE for its failure to reform the government’s basic financial strategy in order to abet a healthier and more equitable educational system. Chilean education offers inherently unequal opportunities for students from low-income families, who consistently experience sub-standard educational achievements as a result of an ongoing bias in favor of privatization measures. The government’s school voucher program has not only exacerbated the socioeconomic divide between public and private institutions, but has also ensured that wealthier students have access to quality education, which guarantees their advancement to universities and a choice of careers. 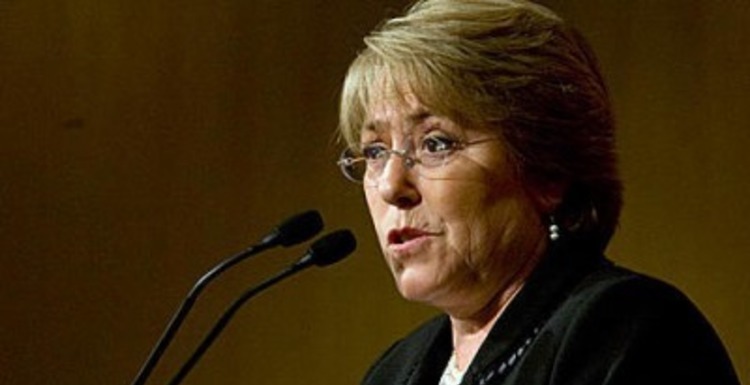 Although President Bachelet’s educational reform is intended to alleviate certain discriminatory practices that prevent low-income students from entering institutions of higher learning, the continuation of Chile’s market-based strategy for school financing will almost certainly guarantee existing inequalities. In 1973, the newly-installed General Pinochet dictatorship established a style of education management in which decisions regarding 80 percent of Chilean schools were determined by the central government in such categories as educational finance, teacher salaries, employment, and curriculum standards.1 However, in the aftermath of the 1980s financial crisis, two important reforms changed the nature of Chile’s education system. The first of these revisions involved the decentralization of education, which transferred the management of local schools to municipal governments. Three types of schools were established during this transition: municipal, government-funded public schools; private schools subsidized by the government; and private, fee-paying schools. Yet, despite the reduced federal intervention in local education institutions, Chile’s decentralization measure resulted in an 18% drop in federal spending on education throughout the 1980s.2 Due to this substantial reduction in government support, municipal governments began to fund these institutions from provincial budgets. This new funding procedure subsequently triggered a divide in the quality of education between wealthier municipalities, which could afford to extend a substantial part of their budget toward schools, and poorer municipalities, which suffered the consequences of a fast withdrawal of federal funding. Privatization of the school system in Chile represents the second major reform. This important piece of legislation established a voucher-type government subsidy available for use in both private and public municipal schools, which are distributed in numbers directly proportional to the size of a school’s enrollment. Government-provided vouchers have encouraged private schools to enter the education marketplace in order to compete for government funding alongside municipal educational institutions. By establishing market competition, the privatization policy was intended to “weed out” inefficient and disorganized schools as students, aided by readily-available voucher subsidies, gravitated toward institutions that would provide a better education. Studies conducted after the introduction of school vouchers noted a relative boom in private education, with a major increase in the number of for-profit schools as well as student enrollment in these schools.3 For example, prior to the 1980 privatization reform, approximately 80 percent of Chilean students attended public schools,4 whereas data following the reform shows a 22 percent decrease in public school enrollment by 1997. In this same period of time, private school student rosters rose to over 40 percent.5 In addition to providing monetary incentive for schools to improve their quality of education, the privatization reforms served to equalize educational opportunities for lower income students, who ordinarily could not afford the exorbitant school fees demanded by privately-funded educational institutions. Despite the government’s ostensible goal in equalizing the quality of education for students across economic lines, three discernible types of inequalities have emerged in its wake: stratification and inequality in access to private education, substantial differences in the quality of education received, and unequal opportunities for students pursuing higher education. As a result of these educational vouchers, the school system has become increasingly stratified due to “creaming,” in which private institutions have enacted selective admission policies designed to accept only the “cream of the crop.” These discriminatory policies have resulted in a sorting effect, in which higher income students have migrated in large numbers to subsidized fee-based private schools, while lower-income students remain entrapped in municipal public schools.8 A statistical study conducted by Gregory Elacqua, professor and researcher at the School of Government at Adolfo Ibañes University, found in 2003 that public schools are more likely to accept disadvantaged student populations in comparison to private institutions. Elacqua’s study concludes that private subsidized schools serve an average of 7 percent less disadvantaged students than municipal schools. Catholic voucher schools were found to be even more discriminatory, admitting an average of 12 percent less vulnerable students than public schools.9 This finding is consistent with studies by other researchers, such as Chang-Tai Hsieh and Miguel Urquiola, and Varun Guari in his book, School Choice in Chile: Two Decades of Educational Reform (1998). As private school enrollment is routinely filled by high-income students, a tendency exists to push low-income students to gravitate toward poorly-financed municipal public schools. A recent study of municipal public school enrollment by Ann Matear, professor of Latin American Studies at the University of Portsmouth, showed that 80.9 percent and 72.1 percent of Chile’s primary and secondary public school populations respectively, were from the lowest five income deciles in the country.10 Creaming continues to be a persistent problem within Chile’s school system. Voucher subsidies have created a sorting effect within the education system rather than extend opportunities to poorer student populations. of resources towards private schools…the 20 percentage point enrollment shift means that a corresponding percentage of the Ministry of Education’s school-related operation expenditures were reallocated to private schools. The study cites a 20 percent drop in the number of public school teachers,11 demonstrating the considerable resource inequality between public and private institutions. The disproportionate supply of teachers and resources in Chile’s schools has adversely affected the quality of education received in municipal public schools. Researchers have explored the relative differences in teaching outcomes through the use of SIMCE test results (see Carnoy 1998, Mizala and Romaguera 2000, Hsieh and Urquiola 2006, Matear 2006). SIMCE, the national assessment system of learning outcomes, was developed in 1988 in order to monitor and refine education policies and set goals for improvement. Results from SIMCE show distinct differences in the average scores between private and public schools. While eighth grade test results from 2000 for public municipal schools showed an average test score of 60.5 (out of 100), subsidized private schools produced an increased score of 67. Fee-paying private schools had the best scores of the three, achieving an average score of 80, nearly 20 points above municipal scores.12 Private educational institutions have steadily maintained elevated test scores while municipal schools have failed to achieve significant improvement in SIMCE test results, supporting the notion that municipal schools have access to significantly poorer learning materials and inadequately trained teachers. As municipal schools experience increasing pressure to compete for funding through the 1980 privatization reform, they have taken rash measures to obtain the necessary financing for additional teachers and supplies. Low SIMCE scores show there is a desperate need to help municipal schools achieve better results. However, increased competition for funding may hurt, rather than help, these schools to provide a quality education. The obvious inequality in teacher supply and student resources differentiates public from private education and reveals a direct correlation with the level of student achievement. A study conducted by Florencia Torche, associate director of the Center for the Study of Wealth and Inequality at Columbia University, showed that while 95 percent of children in the wealthiest income quintile completed secondary school in 2000, only 30 percent of children in the poorest income quintile completed the same level of education that year.15 This has important consequences for students attempting to gain entrance to Chilean universities. Research conducted by Matear indicates that universities typically accept a larger percentage of students from private institutions than from municipal public schools. For example, an analysis of student backgrounds at the Universidad de Chile, showed that 50.8 percent of the admitted students were educated in the elite private schools, while a mere 27 percent came from municipal institutions.16 Additionally, of the students attending Pontificia Universidad Catolica (PUC), the most prestigious university in Chile, over 70 percent came from private schools, 14.3 percent from subsidized private schools, and only 15.1 percent from municipal schools.17 These statistics show that low-income municipal students often do not have equal access to tertiary institutions due to the poor level of education offered by the rank-and-file of Chilean public schools. LGE is a reform package that includes many measures designed to regulate the effects of privatization, including the redistribution of government funds toward public schools and the creation of a Quality Assurance Agency to monitor any evidence of discriminatory selection processes within fee-based private schools and universities, as well as unequal test scores between high-income and low-income students. Other provisions of the LGE legislation set higher standards for persons wanting to open subsidized private schools, establish a National Education Council to replace the Superior Education Council created under Pinochet, and fix a four-year deadline for educational administrators to declare their institutions non-profit. Proponents of the LGE bill insist that these revisions will eventually curb the negative effects of privatization. Despite the best of intentions, the promotion of the LGE bill in 2006 sparked intense protests among Chile’s student and teacher populations. Students claim that privatization is the real enemy due to its failure to eradicate the profit-based nature of the education system. Despite President Bachelet’s commitment to eradicating Pinochet-era education policies (such as the Ley Orgánica Constitucional de Enseñanza (LOCE) which effectively decentralized schools), her recent LGE bill retains the major pillars of the old educational system. For instance, LGE does not include measures to discontinue government subsidies to private schools; instead, it preserves the structures that have allowed for unequal access to private institutions. The president of the Student Federation of the Universidad de Chile (FECH) states, “The main point we want to express today is that we reject having the profit motive inserted into education on any level – elementary, high school, and in the university…education reform is the only means we have for solving the social problems in this country.” Students point out that there are no incentives for schools to provide a better education because both public and private schools receive equal subsidies. Therefore, profit motives defeat the purpose of the privatization reform in eliminating poor-performing schools through market policies. More importantly, concerned students and teachers protest the lack of opportunities available to low-income families. By failing to revise the provision of subsidies to private schools, the Chilean government continues to undermine public education, which provides service to over 50 percent of Chile’s low-income student population. Low SIMCE scores and the inability to gain admission to higher education institutions have proven that Chile’s education system experiences structural problems due largely to privatization. President Bachelet’s LGE bill does not adequately address pressing issues regarding public education. While the General Education Law mandates the creation of a Quality Assurance Agency to oversee SIMCE standardized tests and regulate the performance of school administrators, this essentially conservative piece of legislation neglects to correct the root cause of the system’s problems: privatization. Despite student and faculty efforts to stall the forward movement of the LGE through Congress, the bill has already passed through the Chamber of Deputies and is currently on the Senate floor for a final vote. If ratified by that body, Chile will continue its lamentable tradition of inequality in the country’s educational institutions. As thousands of students continue to march against the contested LGE bill, it is clear that today’s pupils will not stand for the deplorable conditions that directly affect their, and their less fortunate counterparts’, futures. Many worry that the LGE measure does not do enough for Chile’s low-income students and will instead serve to maintain Pinochet’s creed of favoring those coming from wealthier backgrounds, while subjecting the poor to inferior learning standards. In order to correct the current inequalities within the school system, the Bachelet government needs to reassess the structure of Chile’s education system and strive for a long-term overhaul of Pinochet-era divisions between rich and poor families. Chile’s education system is failing the students that need it the most. Rather than continue privatization, critics argue that Santiago should discontinue voucher subsidies to all private schools and instead redirect such funds to public education. This major reform would marshal badly needed monetary resources in order to better provide a quality education in public schools and help raise SIMCE scores. Free public education is an intrinsic human right, and Chilean authorities should be prepared to more effectively prioritize this essential public service to ensure a brighter future for the children of the country’s low income and entrenched poor populations. 1 Mizala and Romaguera. “School performance and Choice: The Chilean Experience.” Journal of Human Resources 35, no. 2 (2000) 394. 2 Carnoy, M. “National Voucher Plans in Chile and Sweden: Did Privatization Reforms make for Better Education?” Comparative Education Review 42, no. 3 (1998). 317-318. 3 Elacqua, Gregory. “Enrollment Practices in Response to Vouchers: Evidence from Chile.” National Center for the Study of Privatization in Education (NCSPE). (2006) 7. 4 Torche, Florencia. “Privatization Reform and Inequality of Educational Opportunity: The Case of Chile.” In Sociology of Education, Vol. 78 (2005) 322. 5 Mizala and Romaguera. 397. 9 Elacqua, Gregory. “Enrollment Practices in response to Vouchers: Evidence from Chile.” 12. 11 Hsieh, C. and Urquiola, M. “The Effects of Generalized School Choice on Achievement and Stratification: Evidence from Chile’s Voucher Program.” Journal of Public Economics 90 (2006) 1481. 12 Mizala and Romaguera. 399. 14 Shadko, Leigh. “Chile Schools May Have Tried to Skew Test Results.” The Valparaiso Times, 05 June 2008. http://www.valparaisotimes.cl/content/view/382/388/. ← WTO Talks Collapse: Was There Ever a Future for Bananas? Nicaragua Under Daniel Ortega’s Second Presidency: Daniel-Style Politics as Usual?